Offset Litho by R.C. Gorman. R.C. Gorman. "Rio Grande". Image Size: 23.5" x 27". Art Size: 21" x 24.5". FREE Trial ! "Santo Domingo". Offset Litho by R.C. Gorman. R.C. Gorman. Art Size: 21.5" x 26". FREE Trial ! Their use of color and freedom of style stimulated his imagination. Offset Litho by R.C. Gorman. He developed and refined this technique and still uses this approach forty years later. Gorman, R.C. "THE DANCER". R. C. GORMAN. BY R.C GORMAN. THIS PICTURE IS TAKEN FROM THE ARTISTS ORIGINAL. Motherhood or Madonna and Child. Possibly Circle of or Influenced by R. C. Gorman. Hard molded plastic base is a bit dusty. R.C. 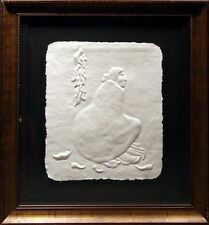 Gorman "Aunt Etta" framed Paper Cast Hand Signed & Numbered Art Make Offer! By R.C. Gorman. R.C. Gorman. Original Limited Edition Paper Cast. Hand signed by the artist. Image Size: 18" x 23". Condition: Mint. "Civia " by R.C. Gorman. Before moving to Taos, R.C. Gorman had enjoyed an active career in several venues.During a stint in the Navy, he drew portraits of his fellow sailors girlfriends.Borrowing on the style of Alberto Vargas. "La Donna and Child". R.C. Gorman. Hand Signed by R. C. Gorman. Image Size: 25"x23.25". FREE Trial ! Item Size: 32"x 23.5". "Orange Shawl" by R.C. Gorman. "Orange Shawl". R.C. Gorman. Image Size 19"x 23-5/8". FREE Trial ! Item Size: 22.75"x 28.5". "Bernadette". R.C. Gorman. FREE Trial ! Image: Size 23" x 17.75". "Tonto Bowl". Offset Litho by R.C. Gorman. R.C. Gorman. Art Size: 24" x 19.5". FREE Trial ! Before moving to Taos, R.C. Gorman had enjoyed an active career in several venues.During a stint in the Navy, he drew portraits of his fellow sailors girlfriends.Borrowing on the style of Alberto Vargas. "Zia Bowl". Offset Lithograph by R.C. Gorman. R.C. Gorman. Available to you is this limited edition, hand signed and numbered in pencil, lithograph by R.C. Gorman. 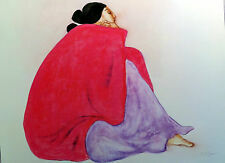 “Chief’s Blanket” depicts a young Navajo woman looking into the distance, while sitting wrapped in a colorful large blanket. 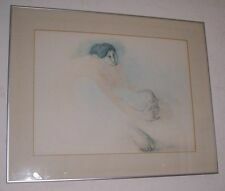 R C Gorman Jonie Offset Lithograph Print - Mint Condition. Offset Lithograph Print by R.C. Gorman. R.C. Gorman. Item Size: 25.5" x 28". R C Gorman Lady Snoozing Art Print. "Lady Snoozing. R.C. Gorman. Mint Condition. Image Size: 15" x 19". The ink drawing is on the title page of his catalog raisonne' of his lithographs, a collector's book that is hardcover with color dust jacket and a glassine jacket. It is dedicated as "To Rupert" and the Gorman's signatures are turned in this Jamaican dancer. R C Gorman Poster"Rosa" Vintage GALLERY Poster FREE SHIPPING Make an Offer! Offset Lithograph by R.C. Gorman. R.C. Gorman. Art Size: 30" x 24". "Civia" by R.C. Gorman. Image Size: 20" x 26.5". Item Size: 24"x 28.5". "La Donna and Child". R.C. Gorman. Image Size: 25" x 23.25". Not hand signed. Size: 17" x 22-1/4" (43.2 x 56.5 cm) image size. Paper size 20" x 26". R C Gorman Poster "Miss January" Hand Signed Vintage GALLERY Poster MAKE OFFER! Hand signed by R.C. Gorman. Artist R.C. 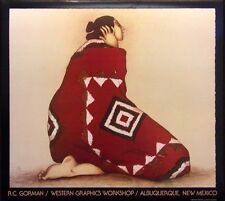 Gorman was born in Chinle, Arizona, on July 26, 1931. R. C. Gorman. After spending several years in San Francisco developing as a painter, he moved to Taos, NM. Ed Singer, Dine, born in Tuba City, A.Z., attended boarding schools in Arizona and Utah, continuing his study of fine art in college at Southern Utah State College and Northern Arizona University. "Who is R. C. Gorman". Not hand signed. Artist R. C. Gorman. Size: 27-1/2" x 22" (69.9 x 55.9 cm) image size. Paper size 30" x 24". Originality Open Edition Print. Print Surface Paper. "La Donna and Child". Hand signed by R.C. Gorman. R.C. Gorman. Before moving to Taos, R.C. Gorman had enjoyed an active career in several venues.During a stint in the Navy, he drew portraits of his fellow sailors girlfriends.Borrowing on the style of Alberto Vargas. Offset Lithograph print by R.C. Gorman. R.C. Gorman. This print is NOT HAND SIGNED. Item Size: 20" x 16". "Kiana"by R.C Gorman. Hand signed by R.C. Gorman. R.C. Gorman. FREE Trial ! Hand Signed Offset Lithograph. Item Size: 22 ½" x 17 ½". Beautiful and rare, RC Gorman’s “Red Concho” is a lovely example of why this talented artist’s work continues to be so highly sought after. Earth tones, cool blue skies, and a splash deep red will make this the focal point of any room. 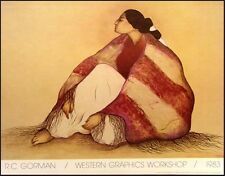 R C Gorman Nori Print Hand Signed Mint Condition. Hand Signed by R. C. Gorman. R.C. Gorman. Item Size: 24"x 30". R.C. Gorman. Before moving to Taos, R.C. Gorman had enjoyed an active career in several venues.During a stint in the Navy, he drew portraits of his fellow sailors girlfriends.Borrowing on the style of Alberto Vargas. Very good condition with a few minor white stains on the top black background - see detailed pictures. Not hand signed. Artist R. C. Gorman. Size: 17" x 22-1/4" (43.2 x 56.5 cm) image size. Paper size 20" x 26". Originality Open Edition Print. Print Surface Paper. Hand signed by R.C. Gorman. R.C. Gorman. Before moving to Taos, R.C. Gorman had enjoyed an active career in several venues.During a stint in the Navy, he drew portraits of his fellow sailors girlfriends.Borrowing on the style of Alberto Vargas. "Pottery Keeper". R.C. Gorman. Art Size: 17" x 22". 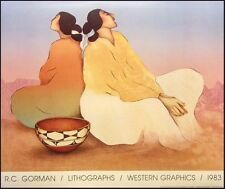 R C Gorman Vinatage Gallery Fine Art Poster Mint Condition SUBMIT BEST OFFER! R.C. Gorman. Image: 25.75" x 22". Item Size: 30" x 24".